Last Friday, Sally Davies, the Chief Medical Officer, described the belief that moderate alcohol consumption was good for the heart as an ‘old wives’ tale’. This was the culmination of a long-running campaign within a section of the public health lobby to cast doubt on the large body of evidence showing lower rates of heart disease and lower rates of mortality among moderate drinkers. A report from researchers at Sheffield University, released on the same day, claimed that the health benefits of drinking were ‘disputed’ and the subject of ‘substantial debate’. It is difficult to imagine any amount of evidence persuading Sally Davies that moderate drinking is healthy. The protective effect of alcohol on the heart was first observed in 1926 and countless studies from all around the world have confirmed it in the 90 years since. It seems that Davies places a much greater burden of proof on scientists who find a positive effect from drinking than on those who find a negative effect. This can be illustrated by looking at two light bulb moments in the career of the legendary epidemiologist, Richard Doll. In 1950, Doll, along with Austin Bradford Hill, published the first epidemiological study showing a link between cigarette smoking and lung cancer. Many people were sceptical and potential flaws were quickly flagged up. The study had been limited to hospital patients in and around London, the vast majority of whom were smokers. In response, Doll and Hill got back to work and published a further study in 1952 which expanded its geographic reach. It came to the same conclusion. Doll then initiated a prospective study which tracked the health of smoking and non-smoking doctors around the UK. When the first full findings were published in 1956 they once again showed a clear link between smoking and lung cancer risk. In the meantime, researchers from other parts of the world conducted similar epidemiological studies with similar results. Gradually, it came to be accepted that the relationship was causal — smoking caused lung cancer. Scepticism did not disappear overnight but as the years went by it was increasingly confined to the vested interests of tobacco companies and to maverick scientists who put forward alternative theories which might explain the statistical association between smoking and ill health. For example, the great statistician Ronald Fisher suggested that the early stages of lung cancer gave people the urge to smoke. Implausible though they were, such theories were not rejected out of hand but were subject to rigorous empirical testing until they were found wanting. By 1976, when Richard Doll and Richard Peto published another edition of the doctors’ study, there was a wealth of evidence to support ‘the smoking theory’ (as it had been known) and there was a broad scientific consensus that the relationship between cigarettes and cancer was causal and proven. Alternative explanations had been tested and debunked. Some people still refused to believe it, but they were a dwindling minority. The sceptics now became ‘merchants of doubt’, cherry-picking individual studies that seemed to undermine the larger body of evidence and raising spurious objections that had already been addressed in the scientific literature. Some demanded an impossible burden of proof by calling for randomised control trials which could not possibly be conducted even if it were ethical (which it would not be). Others said they would not believe smoking caused lung cancer until the exact biological mechanism by which it did so was identified. Then, in 1994, Doll (now Sir Richard Doll) identified another statistical association in the data from the doctors’ study. In a study published with Richard Peto, he found that all-cause mortality was lower among moderate drinkers than it was among non-drinkers and heavy drinkers. It was not the first time such an association had been observed but some people were doubtful — not about the risks of heavy drinking but about the apparent risks of not drinking. Alternative explanations were again put forward, notably the possibility that some non-drinkers may have been former drinkers who had put their health at risk and were therefore at greater risk of premature mortality. This came to be known as the ‘sick quitter’ hypothesis. As he had done when conducting research into smoking, Doll addressed his critics by carrying out a new epidemiological study. He published an article in 1997 looking at the question of causality which rejected the hypothesis that the association was due to confounding factors. Then, a few months before his death in 2005, he published a study based on 23 years of data which replicated the results of his previous studies while disproving the sick quitter hypothesis by comparing lifelong non-drinkers with moderate drinkers. The latter had lower rates of heart disease and lower risk of premature mortality. By this time, Doll concluded: ‘That the inverse relationship between ischemic heart disease and the consumption of small or moderate amounts of alcohol is, for the most part, causal should, I believe, now be regarded as proved’. A Department of Health working group appeared to agree, noting: ‘All the evidence we have received confirms that the relationship between all-cause mortality and alcohol consumption follows a J-shaped curve. Non-drinkers have higher all-cause mortality than light and moderate drinkers’. Doll was not alone in this research. As with the smoking-lung cancer finding, he was supported by researchers from around the world whose studies came to the same conclusion: moderate drinking lowered the risk of all-cause mortality and of heart disease in particular. In 2006, a meta-analysis of 34 prospective studies concluded that men who drank up to four drinks a day and women who drank up to two drinks a day had a lower mortality risk than those who did not drink at all. The sick quitter hypothesis was repeatedly tested and found wanting. The protective effect on the heart was repeatedly shown to be real and not the result of unhealthy former drinks in the non-drinking group. Taken as a whole, the evidence was too strong to overcome, but so long as the critics persisted the evidence would, by definition, be ‘disputed’ and there would still be a ‘debate’. That was the line taken by the authors of the Sheffield University report when the Chief Medical Officer commissioned fresh research for the new drinking guidelines. In the 20 years since the Department of Health’s working group had concluded that epidemiological studies ‘strongly indicate a direct causal relationship’ between moderate drinking and cardiovascular health, the evidence had grown and become stronger, but anyone reading the Sheffield report would have got the impression it was on the brink of falling apart. Anyone listening to the Chief Medical Officer on the Today programme would have assumed it had already fallen apart. ‘An old wives’ tale’, she said. And with that, the job was done. CMO justifying a grossly inflated salary, based on giving credence to vanishingly small levels of risk. I have news for her: breathing kills too (100% of those who do it, die). I don’t particularly want to breath the contents of some stranger’s lungs either, but up until now had considered it unavoidable. Of course banning other people breathing in all enclosed public spaces would be impracticable – compulsory masks, perhaps? This is an excellent article that helps to emphasise the depths to which standards have plummeted and the degree to which vested minority interests have been allowed to undermine science and in fact society. The man who worked so diligently to persuade others of the link between smoking and lung cancer must be turning in his grave as lesser men and women abuse his legacy. According to some accounts Doll was in many ways not an especially nice man and he was a bit obsessive about tobacco smoking. I respect him because he never stooped to the low politics and misleading quackery favoured by the likes of Ian Gilmore but stuck at the science and let it ultimately do his campaigning. As for Sally Davies, dismissing the work of decades as “old wives tales” on the basis of a barely literate report from an unreliable and demonstrably partisan source is not acceptable behaviour for someone in her position. Her performance and that of her less than objective team is absolutely shameful. It speaks volumes about the sick society that we have created. There is much more to a healthy society than what can be gleamed from its cancer statistics. Despite the fact that “he was a bit obsessive about tobacco smoking” Doll was adamant that there was no link between passive smoking and health problems and if there were they must be so so tiny there weren’t worth considering. And yet lesser men and women abuse his legacy by stooping to low politics and misleading quackery to promote the vested minority interests of the anti-smoking lobby that have been allowed to undermine science and in fact society! The so-called charity sector is behind all this nonsense. Alcohol Concern and all the other parasitic vermin get tax-payers’ money based on exactly this sort of lie. Fisher suggested genetic affinity for smoking might be linked to lung cancer vulnerability. Hence his small study into identical twins which did indeed confirm a correlation between genes and smoking. Randomised Intervention studies (on persuading people to quit) were carried out, contrary to your implication. The multimillion dollar MRFIT study being a case in point. For ethical and practical reasons, all of them were concerned with whether persuading people to quit worked and with whether there were health benefits. All the studies found that persuading people to quit did work but did not lower overall rates of lung cancer or heart disease or even improve mortality . My late grandmother had an arthritic condition all her life. Even her wedding photos, showed her leaning on a chair. She was married to a farmer and , despite having a large family, helped with the small ‘household’ chores, including chickens, eggs, milk churns, and so on. As she got older and with only one son to assist, her workload actually increased. She was very religious, reading her prayerbook every evening and praying. She was very conservative and did not approve, in any way, of excess drinking. She did, however, have a glass of brandy, at nine o’clock each evening, to relieve the pain, which was constant, before going to bed, for a six a.m. rise. I think she did this for over forty years and worked, although almost bent double, until she was ninety-two years, her last two years being bed-ridden. She used to ask God, for forgiveness, for her indulgence. I believe that alcohol, in moderate amounts can be of great mental and physical comfort to elderly people. Some good analysis here by Christopher Snowdon that it is hard to disagree with. Turning twenty years of advice on its head, removing the distinction between male and female consumption and claiming that every glass of sherry portends doom is, frankly, pretty daft and brings public health advice into disrepute. I have no intention of becoming embroiled in a deep discussion here (that would normally be required to challenge complex anti-smoker mendacity). There are enough anti-smoker nutters out there for that (eg will berti turn up?) without debating with someone who is already aware of the inveterate mendacity that pervades the anti-smoker industry. I will simply draw attention to a few relevant points and matters of dispute that have allegedly been ‘proven’ (falsely) and underpin the whole anti-smoker/healthist movement. As Chris Oakley points out “Doll was in many ways not an especially nice man and he was a bit obsessive about tobacco smoking”. Apart from this, Doll worked as a scientific representative of the Asbestos, Chemical and Nuclear industries. (ie. those industries that have benefited substantially from deeming almost all public ill health as self-inflicted by smoking (now extending to drinking, over-eating and not exercising enough). Doll’s studies merely found that there were a lot of smokers and a lot of lung cancers in smokers. Other research that allegedly corroborated him were, as Fisher pointed out, mere repetitions of the same, NOT replications that could corroborate him using differing methodologies. In fact no other science, apart from these repetitions, has been able to corroborate Doll! 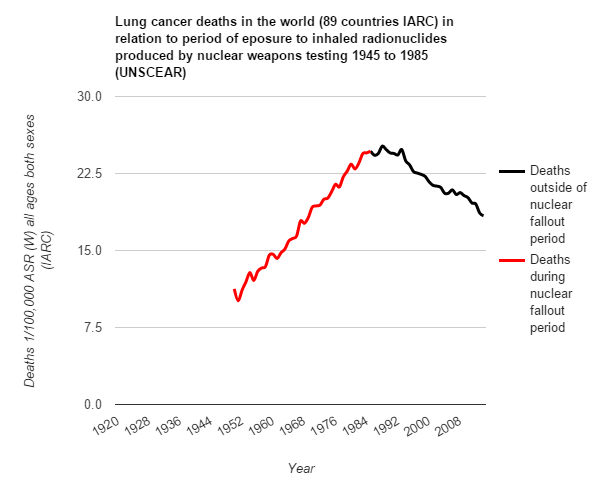 As smoking has declined in western populations, lung cancers have INCREASED (raw count)! Adjusted statistics, favoured by the anti-smoker industry, that show a reduction in lung cancers ALSO show a reduction in lung cancers etc. in countries where smoking prevalence is high and probably increasing. Today there are lots of NON smokers and lots of lung cancers in NON smokers – reversing the correlation found by Doll. “Others said they would not believe smoking caused lung cancer until the exact biological mechanism by which it did so was identified.” This is not just VERY important, it is crucial! For goodness sake, the best scientists in the world have been trying for a generation and more to prove the ‘smoking causes lung cancer’ hypothesis but have consistently FAILED, often finding the opposite of harm. The anti-smoker industry did not win their ground by ‘science’, they did it by being much better at painting themselves as whiter-that-white and convincing the public etc that their opposition, the tobacco companies and those individuals associated with them, were liars and cheats. They created a hate figure (a God versus Devil pseudo-religious emotive scenario) using propaganda and smear tactics so that non-tobacco CONTROL ‘science’ would be discounted out of hand and theirs, however absurd, would be accepted with naive open arms. The tobacco companies did indeed buckle under at such pressure – but look at how well their business is doing now! It is worth bearing in mind that all the religious ‘experts’ at one time were convinced that the Earth was the centre of the universe and they refused to listen to Galileo for many years. Let’s not perpetuate the C20th – C21st version any longer than is necessary. Neither illness nor death were caused as a result of that earlier faith and ‘consensus’ dispute between ‘experts’ and reality. Right on cue berti! Am I your obsession? The incidence rates flow precisely together and it didn’t matter if there was more smoking or less…………meaning that risk is absolute JUNK SCIENCE. 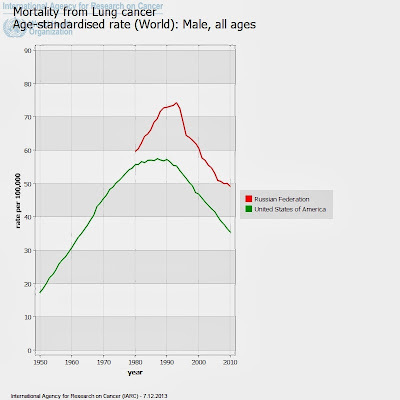 Smoking reducing in USA and increasing in Russia … BUT lung cancers reducing in both. Now there’s a novelty that should wake up even the most brainwashed – not you though eh berti! I have already answers this case to Frederik. Do go away berti – already covered and explained. Who is laughing at whom berti? – look in the mirror. That chart showing cigarette use and lung cancer is deeply misleading because it does not show other countries. In Sweden for example (due to snus use) cigarettes became popular during and not before their rise in lung cancer see here. Or the global general rise and fall in in lung cancer which is clearly independent of cigarette use in the last century. The authors of the paper agree. “Although commonly assumed to be a modern disease, the presence of atherosclerosis in premodern humans raises the possibility of a more basic predisposition to the disease,” they concluded. Re. McTear vs. Imperial Tobacco. The question: Can cigarette smoking cause lung cancer? “General causation: The judge found that the results of animal experiments conducted in the 1950s and 1960s failed to support the general causation hypothesis. Although this was not a crucial point in itself, it was nevertheless significant, as proof of a causal connection between cigarette smoking and lung cancer would depend solely on the conclusions from epidemiological studies. The judge stated that, on one view of the scientific approach, these studies “could be regarded as yielding no more than untested hypotheses.